The Belton-Honea Path News-Chronicle serves residents living in southeastern Anderson County (Belton-Honea Path) and northern Abbeville County (Donalds). Our circulation is about 4,000. As one of the two weekly newspapers in Anderson County, we strive to present a comprehensive look at the local community on a weekly basis featuring everything from humor to crime news and honor rolls. We feature local writers, photographers and columnists. Over the last several years, the newspaper has won numerous awards for writing and photography on the state level. The Honea Path Chronicle was founded in 1894 and The Belton News in 1925. They were combined in 1990 by then-publisher Joe Coward. 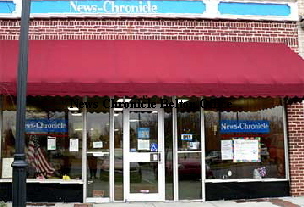 In 1994, the paper was purchased by the Ellison family, who still own and operate The News-Chronicle. .The office is located in downtown Belton at 310 Public Square in the town's historic district. A drop slot is located to the left of the door for after-hour subscriptions, articles, letters, etc. Items may be faxed, emailed or mailed (P.O. Box 606, Belton, S.C. 29627).